From London, the United Kingdom to Rhode Island on the East Coast of the United States, September 16 was a big night for boxing. While the GGG vs Canelo main event was the most talked about match, and predictably so, a number of undercards on the three boxing events in Las Vegas, London and Rhode Island are worth highlighting for delivering strong performances that entertained and showcased skills worth watching in future bouts. It took less than two full rounds for the 19-year-old Ortiz to dispose of 31-year-old Valenzuela. Ortiz dropped Valenzuela twice in the second round with sharp uppercuts to the body, forcing the older boxer to concede the fight. What was notable with this match was Ortiz’s skill level, fighting at a level higher than his age group. He threw sharp, decisive combinations that made their mark on Valenzuela’s face in the first round. Ortiz produced not one but two knockdowns, and this fight was the only knockout stoppage of the evening. Oscar de la Hoya, Golden Boy Promotions co-founder, is openly bullish on Ortiz. Last Saturday, the young boxer from El Paso, Texas did not disappoint. Federica Bianco (left) and Marcia Agripino (right) battle it out at the Twin River Casino in Rhode Island. Photo by Women’s Boxing. Bianco vs. Agripino makes it to this notable list for four action-packed rounds and one of the best matchups of the evening in Rhode Island. While both boxers had relatively little professional experience, they made up for it with a lot of heart and athleticism. From the first bell, both boxers went on attack mode and were trading punches consistently through the entire four-round fight. What was more impressive was that this fight came after a layoff, especially for Agripino. Agripino’s last fight was in 2013 against Michelle Cook, which ended in a draw. A nurse by trade, the 35-year-old nurse returned to the ring last Saturday with a high level of athleticism, fiercely trading power shots with Bianco. Bianco, 38, last fought in 2016 and won her bout against Elisa Collaro in Rochester. An astrophysicist by profession who teaches at New York University, Bianco eventually prevailed over Agripino for delivering the more accurate punches, although the fight must have been one if not the most difficult bouts to score of the evening. 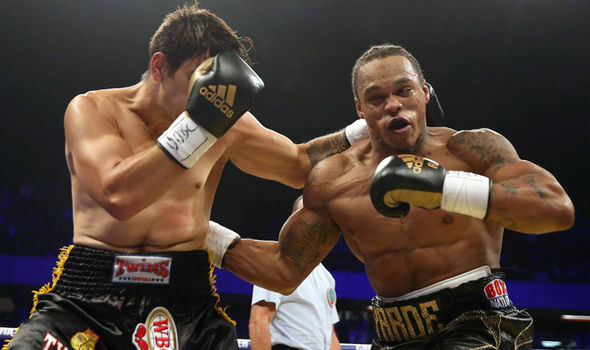 Anthony Yarde (right) proved too much for Nerbert Nemesapati (left). Photo by Daily Express. Newcomer Anthony Yarde is somewhat of a phenomenon in boxing. With the physique of an American football player, his lithe and quick feet almost come as a surprise. On Saturday, Yarde dropped the more experienced Hungarian fighter twice in the second round with the first knockdown triggered by furious right-hand hooks to Nemesapati’s head. Nemesapati, who stepped into the ring with 32 bouts, somehow survived the two knockdowns and managed to go for a third round, although it was clear from the first few minutes that the fight had ended the previous round. Yarde forced a retirement after the third. Before September 16, Yarde just had 12 professional bouts, of which 11 were won by knockout. Unlike many of his peers, he just has 12 amateur contests with 11 coming by knockout, scaring away potential opponents and forcing him to go pro. His easy victory over Nemesapati confirms that the 26-year-old London native is a serious prospect to watch out for in the years to come.